By now many people know something of the story of the small-town petition from which big things grew. In December 2015 students from Otorohanga College and their supporters presented a petition signed by over 12,000 people to Parliament. Some eight months later the government announced that a national day of commemoration for the New Zealand Wars would be established. Rā Maumahara was born. Less well-known is that the Otorohanga College students had a second objective. They wanted the history of these conflicts to be taught in all schools. We are still waiting on that one. The Ministry of Education strongly opposed this aspect of the petition in a 2016 submission to the Māori Affairs Committee, while admitting it had no idea how many students studied the New Zealand Wars. Anecdotally, many people have told me they learned nothing of these wars. But I was curious to know more. So I took to social media. Last week I put up a Twitter poll with a simple question: Did you learn about the New Zealand Wars at school? The response was phenomenal. 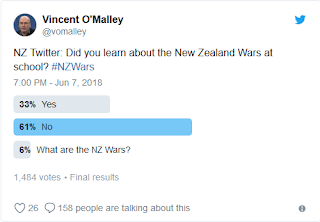 1484 people of all ages responded in the three days the poll was running, many leaving comments about their experiences of learning (or not learning) about the New Zealand Wars at school. They were thoughtful, frank, sometimes heart-warming and at others outright depressing.